Robert Wright Cabaniss - 1919.
and comprehensive history of R.W. Cabaniss. as well as five wonderful pictures. I heartily recommend it to your attention. "In 1917, the greatest need was to find some way of assimilating the volunteers who, paradoxically, while making expansion possible, by their very numbers also made it difficult. With more men on board than could be accomodated within the existing structure and others coming in faster than facilities could be provided, it was all too clear that something had to be done --- and quickly. And that was the way it was done." which includes a reference to R.W. Cabaniss. This PDF file contains many great photographs of men and machines of the era. It has one picture of R.W. Cabaniss and a legend in French.. Unfortunately, I can't read French, so I can only speculate that it is of great interest. Born 3 January, 1884, Union Springs, Alabama. Appointed from Alabama. After graduation Cabaniss served on the Asiatic Station and on the Pacific Coast until 1915, when he took flight training at Pensacola and became qualified Naval Aviator No. 36. During World War I, he had duty at the Naval Air Station, Pensacola; command of the aviation detachment at Massachusetts Institute of Technology; and in 1918, he was overseas in Paris. later he commanded the NAS, Moutchie-Lacanau; then served at Pauillac and at Bordeaux. 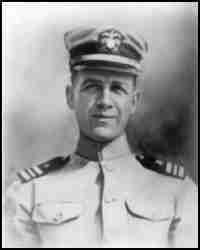 After the war, he commanded NAS, Rockaway Beach, Long Island; had duty at NAS, Pensacola; in 1921, Executive Officer, aircraft tender, USS Wright; and in 1926, he took command of the aircraft tender, USS Aroostook. While on this duty he was killed in the crash of a PN-9 plane he was flying on 31 March, 1927, near Navassa Island in the West Indies. He was then in the rank of Commander. Cabaniss Field, commissioned at the NAS, Corpus Christi, Texas, on 9 July, 1941, was named in his honor. SPECIAL AWARD; Order of the Bust of Bolivar (Venezuela). WIFE: Martha Cabaniss, Coronado, California. DAUGHTER: Juliet Harmon Cabaniss (wife of Lt. A.D.A. Crawford, Jr., USNR). Editor's Note: This biography was extracted from the Class of 1906 anniversary book published in 1945, sent to Mr. Joe Cabaniss, San Antonio, Texas by Alice S. Creighton, Head, Special Collections and Archives, Department of the Navy. He has reproduced this document, along with several others, on his website. It is reproduced here through the courtesy of Mr. Cabaniss.